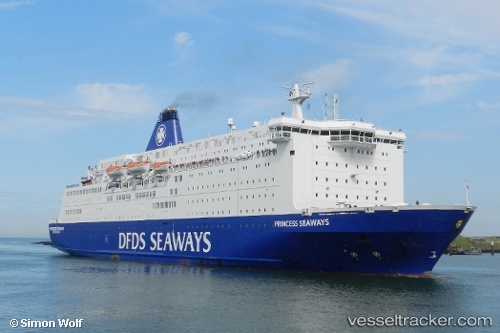 To cover for the drydockings of ro-pax tonnage in the Baltic, DFDS's PRINCESS SEAWAYS will be withdrawn from the IJmuiden-North Shields (Newcastle) route during February/March and will operate for six weeks between Karlshamn and Klaipeda, starting on 7 February. On Oct 13, 2018, at 02.57 a.m. the Danish Radio Medical Service coordinated the medevac of a patient from the "Princess Seaways" in the English Channel. The operation was conducted by the Maritime Rescue Coordination Center Humber as the ferry was in British territorial waters. Seven suspected illegal immigrants were discovered in a trailer at the Port of Tyne. The men, aged between 18 and 37 who were believed to be from Albania, were found by Border Force officers on Apr 25, 2018, at 8.45 a.m. aboard the "Princess Seaways". Six of them have been taken back to the Netherlands, while the seventh was currently being investigated by the Home Office. The men travelled across on an unaccompanied trailer aboard the "Princess Seaways".